Carbohydrates are one of the most important components in many foods. Carbohydrates may be present as isolated molecules or they may be physically associated or chemically bound to other molecules. Individual molecules can be classified according to the number of monomers that they contain as monosaccharides, oligosaccharides or polysaccharides. Molecules in which the carbohydrates are covalently attached to proteins are known as glycoproteins, whereas those in which the carbohydrates are covalently attached to lipids are known as glycolipids. Some carbohydrates are digestible by humans and therefore provide an important source of energy, whereas others are indigestible and therefore do not provide energy. Indigestible carbohydrates form part of a group of substances known as dietary fiber, which also includes lignin. Consumption of significant quantities of dietary fiber has been shown to be beneficial to human nutrition, helping reduce the risk of certain types of cancer, coronary heart disease, diabetes and constipation. Food Quality – physicochemical properties of foods such as sweetness, appearance, stability and texture depend on the type and concentration of carbohydrates present. Chromatographic methods are the most powerful analytical techniques for the analysis of the type and concentration of monosaccharides and oligosaccharides in foods. Thin layer chromatography (TLC), Gas chromatography (GC) and High Performance Liquid chromatography (HPLC) are commonly used to separate and identify carbohydrates. Carbohydrates are separated on the basis of their differential adsorption characteristics by passing the solution to be analyzed through a column. Carbohydrates can be separated on the basis of their partition coefficients, polarities or sizes, depending on the type of column used. HPLC is currently the most important chromatographic method for analyzing carbohydrates because it is capable of rapid, specific, sensitive and precise measurements. 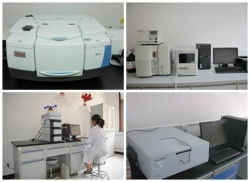 In addition, GC requires that the samples be volatile, which usually requires that they be derivitized, whereas in HPLC samples can often be analyzed directly. HPLC and GC are commonly used in conjunction with NMR or mass spectrometry so that the chemical structure of the molecules that make up the peaks can also be identified. EPRUI supplies a kind of cationic exchange chromatography media which is prepared by sulfonating PS/DVB microspheres to make it hydrophilic following by chelating of various ions such as hydrogen(H+),calcium (Ca2+) and sodium (Na+). Ligand exchange is a preferred method for the chromatographic analysis and separation of many sugars and sugar alcohols due to the advantage of simply using water as eluent. In the process of ligand exchange, the negatively charged hydroxyl groups in carbohydrate molecules interact with the positively charged metal containing groups on the chromatography substrates. The carbohydrates are eluted by polar water mobile phase.